I throw the jar into the fire. It explodes in a shower of sparks. It is gone, but the effects are still lingering within me. I cry on His shoulder for a while, alternately feeling the sting of those words and the terror of the infant. “Let me look at you.” He instructs, helping me to my feet. Reluctantly, I rise to obey. We are close to the fire. I feel its heat upon my bare skin. I cannot help myself. I drop my face as His gaze falls on me. My heat aches with the wretched ugliness that has been declared over me. “No, this time you must look at Me” He takes my face in His hand, gently lifting it. I open my eyes and see a tenderness and love so profound I cannot comprehend. "You are not an ugly little thing." The words burn within me. “You are beautiful.” He pauses making sure I have heard. “I have created you, fitted you exactly to my purposes and you are perfect in that. You are beautiful.” He strokes my face, across my eyes, my cheeks, lips, throat, ears telling me what He has created them for and they are beautiful, exactly as He intended them to be. He holds my arms, shoulders and hands, telling me what He has wrought in me, purposed to teach His people How to live. He touches my heart and shows me the necklace I wear. Silver and engraved with those awful words, that I have worn for so long it is fastened to my heart. I try to obey, but cannot remove it. “I forgive my mother,” my words are hardly above a whisper, almost as though I do not want to hear myself say them. I have hung on to this along time. Letting go is difficult. The chain breaks, but the plaque is still embedded upon my heart. “How can I remove this!” I cry out, pulling fiercely, at the stubborn piece. I obey, repenting of believing the lie told me so long ago. Finally the horrid words are loosed from my heat. I pry them off and fling them fiercely into the fire. I can see my heart is raw and wounded beneath. “Let Me heal you now.” His soft voice is almost a shock amidst the ugliness I feel covered by. He takes me back to sit with Him. Gently, He covers my wounds with His balm. As the pain subsides I feel my self relax in His presence. I wait, wondering what is next and am surprised as He places a new necklace around my neck. Unlike the first which was flimsy and cheap, this one is substantial and heavy. I cannot help but reach up to touch it. “Go ahead, child. Look and see what I have given you. Do not be shy, I will not take it away.” His tender encouragement spurs me on to take the pendant in my hand. Lifting it, I am stunned to see a large faceted store; my birthstone! 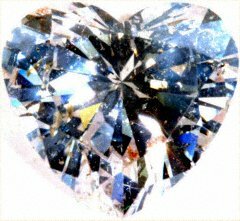 A diamond in the shape of a heart. One side has engraved on it: Fragrant offering of thanks. The other bears the words: Unmerited favor. It is beautiful and it bears my name. With my name upon it I know it was intended for no one else. So precious a gift, intended for me! “Keep this over your heart for it is the truth.” He holds me and I nestle in close.
" This is not all there is for me to deal with, is it ?” I finally ask, already knowing the answer. “No, but rest a bit here before we go further.” He does not release me from His embrace. I feel safe and secure in His arms.